Less than a week after 24 candidates ran for the office of president of Guinea, the results are in. As expected, three candidates gained most of the votes, but none has a plurality. So a run-off election will be held in a few weeks. The good news is that the leading candidates are all committed to democracy and a free media. Cellou Dalein Diallo came in first with 39.72%. He is a member of the Fula ethnic group. He is an economist and a former prime minister who campaigned on an anti-corruption platform. Next - Alpha Condé - a member of the Mandinka ethnic group. He came in with 20.67% and has a long history of being in opposition to whoever is in power. He also served some jail time and has a reputation for being a man of integrity. In third place is Sidya Touré with 15.6%. He also served as prime minister in the 90s and was dismissed and jailed for being overly zealous in his efforts to purge the government of corruption. In the massacre of September 28 last year, he was badly beaten but still managed to call the BBC from his hospital bed to let the rest of the world know what was happening in the streets of the capital, Conakry. The 21 remaining candidates gained anywhere from 7.75% to .07%. This is a dramatic and positive outcome. While the supreme court must ratify the vote and the run-off election is now scheduled for July 18, all three leading candidates are committed to an open democracy and a free press. The election was held in an atmosphere of calm and the voter turnout was between 75-80%. 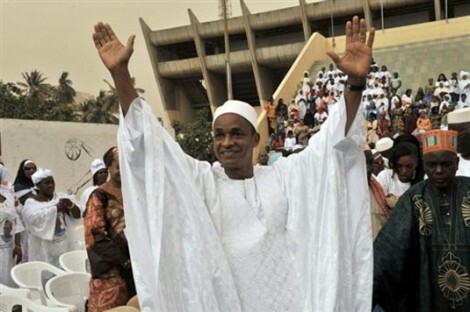 Interestingly, the candidate who had the support of the disgraced ex-president, Moussa Dadis Camara received 1.04% of the vote - a clear repudiation of his legacy and a rebuff to his presidential guard that tried to intimidate voters by roaring around the capital on machine gun mounted jeeps on the days before the vote. The major media component in this election was the dozens of privately owned FM stations around the country. They collaborated to produce a single election night program which broadcast early returns. The fact that returns were aired at all - throughout the evening after the polls closed - produced a sense of confidence that in Guinea, this time, the vote would be fair. The public broadcaster, Télévision et Radio-Diffusion Guinéen seemed unable to broadcast an election night show. Perhaps they did at the last moment, but while I was there, they were unwilling to provide any details of what they planned to do. My sense was that they were so anxious about the outcome, they were paralyzed at the prospect that they might offend the next incoming president. In a country with a very low literacy rate and grim legacy of corruption, commercial radio remains a real - and possibly the only effective agency of democracy. Tremendous reporting, Jeffrey, about the unusual level of cooperation between competing private FM networks. That is a decisive detail that would be completely unknown and unmarked in North America if you had not reported it.